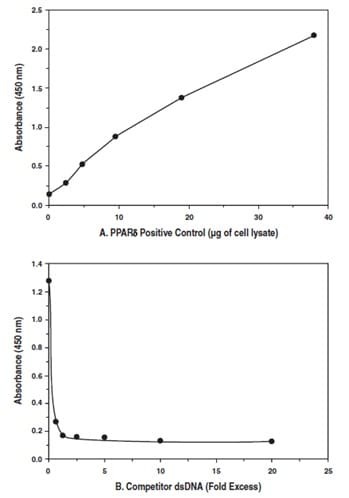 Abcam's PPAR delta Transcription Factor Assay Kit (ab133106) is a non-radioactive, sensitive method for detecting specific transcription factor DNA binding activity in nuclear extracts. A 96-well enzyme-linked immunosorbent assay (ELISA) replaces the cumbersome radioactive electrophoretic mobility shift assay (EMSA). A specific double stranded DNA (dsDNA) sequence containing the peroxisome proliferator response element (PPRE) is immobilized onto the bottom of wells of a 96-well plate. PPARs contained in a nuclear extract, bind specifically to the PPRE. PPAR delta is detected by addition of specific primary antibody directed against PPAR delta. A secondary antibody conjugated to HRP is added to provide a sensitive colorimetric readout at 450 nm. ab133106 detects human PPAR delta. This assay does not cross-react with PPAR gamma 1 and PPAR gamma 2 or PPAR alpha. Peroxisome proliferator-activated receptors (PPARs) are ligand activated nuclear receptors. Three PPAR subtypes have been identified: alpha, delta and gamma. PPARs can be activated by polyunsaturated fatty acids, eicosanoids and various synthtic ligands. PPAR delta is the least understood; however, identification of a high-affinity PPAR delta synthetic ligand suggests a potential role for this receptor in lipid metabolism and obesity. PPAR delta is ubiquitously expressed, but it is particularly abundant in tissues such as liver, intestine, kidney, abdominal adipose, and skeletal muscle. Ligand-activated transcription factor. Receptor that binds peroxisome proliferators such as hypolipidemic drugs and fatty acids. Has a preference for poly-unsaturated fatty acids, such as gamma-linoleic acid and eicosapentanoic acid. Once activated by a ligand, the receptor binds to promoter elements of target genes. Regulates the peroxisomal beta-oxidation pathway of fatty acids. Functions as transcription activator for the acyl-CoA oxidase gene. Decreases expression of NPC1L1 once activated by a ligand. Ubiquitous with maximal levels in placenta and skeletal muscle. Panel A: Increasing amounts of positive control (total lysate) are assayed for PPAR delta DNA-binding activity using ab133106. Panel B: PPAR delta DNA-binding assays are performed in the presence of competitive dsDNA. The decrease in signal caused by addition of competitive dsDNA confirms the assay specificity. There are currently no Customer reviews or Questions for ab133106.